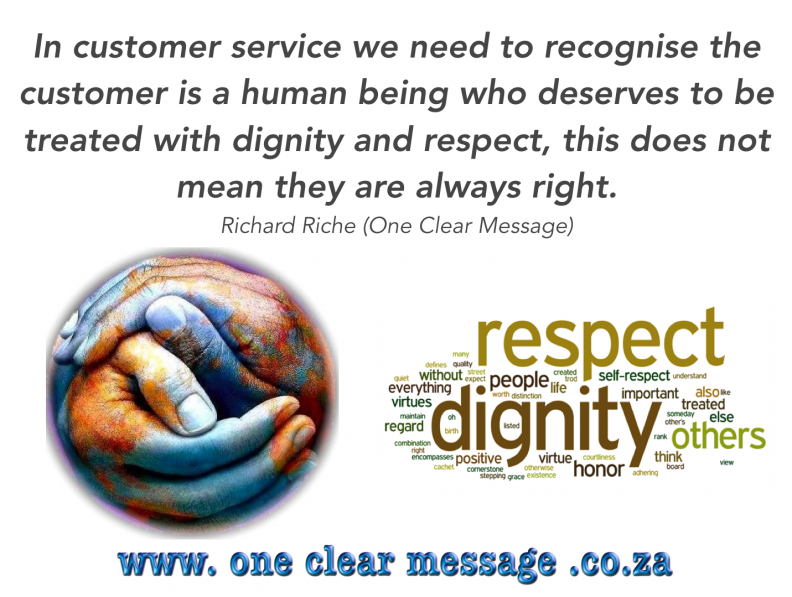 In customer service we need to recognise the customer is a human being who deserves to be treated with dignity and respect, this does not mean they are always right. The idea of the customer is “always right” originated with Harry Selfridge, the founder of Selfridge’s department store in London, in 1909. The concept is often used by businesses to convince customers that they will receive great service and to convince employees they need to give good service. Unfortunately this attitude has increased bad service and reduced Employee Engagement. Who wants to be always wrong when dealing with others? None of us is “always right“. When we have to pretend that a customer is right, even when they are wrong, it irritates most of us. Though the intent behind the mantra is to reduce arguing and to treat customers as valuable, the message it sends to staff is that their feelings and opinions matter less. Not all customers are logical, friendly people and if we side with them over our staff in conflict we are mistreating the people who make our business run. Employees often have to deal with difficult people every day, if we side with these difficult people regardless of what happened we are sacrificing the loyalty of our staff for the ego of a customer. There are better ways to build customer loyalty than pretending they are always right. We have to value our employees as they represent our brand and are the front line who deal with customers, if they feel they are not valued they will not treat our customers as valuable either. 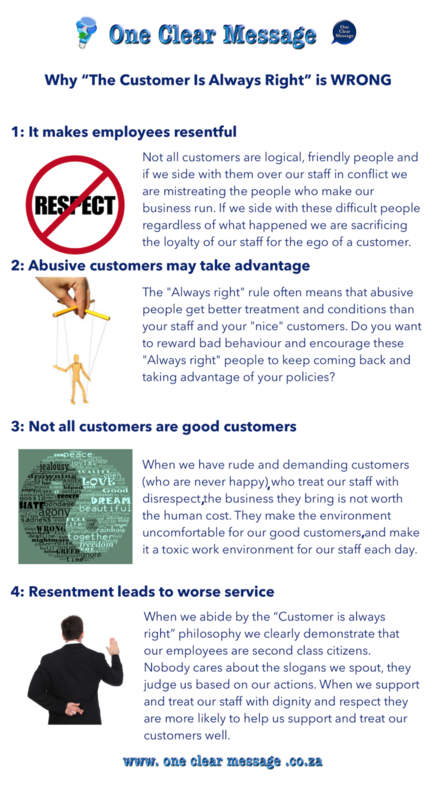 The “Always right” rule often means that abusive people get better treatment and conditions than your staff and your “nice” customers. Do you want to reward bad behaviour and encourage these “Always right” people to keep coming back and taking advantage of your policies? Using the “The customer is always right” slogan gives licence to abusive customers to demand just about anything (after all they are right by definition, aren’t they?) This makes much harder for employees to help customers solve problems by asking questions and helping them discover what they really need (Which is not always what they demand). Instead of asking questions to discover why they want an certain product/service, what their needs are, etc do we just “obey”? Imagine a client “Who is always right” demands a 50% discount. Do you give it to them? Where do you draw the line? 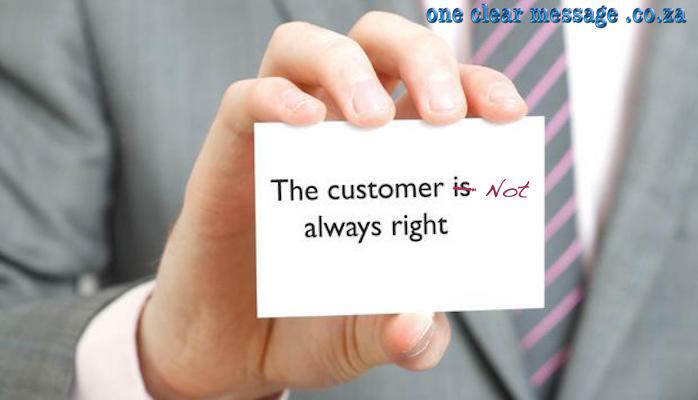 The customer is not always right, but is a human being who deserves to be treated with dignity and respect. Similarly your staff are human beings who deserve to be treated with dignity and respect. 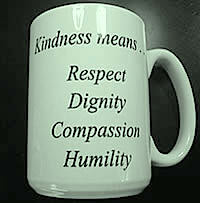 When we treat our staff with kindness, dignity and respect they are more likely to pass this experience on to customers. It is easy to fall into the “more customers is better” but some customers are simply bad for business. When we have rude and demanding customers (who are never happy) who treat our staff with disrespect the business they bring is not worth the human cost. They make the environment uncomfortable for our good customers and make it a toxic work environment for our staff each day. 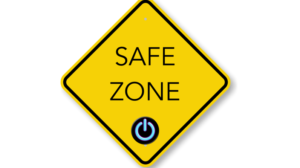 If we side with these toxic customers we are encouraging a less than hospitable environment for customers and staff alike. Though the cost to replace talented staff is currently estimated at about 1 1/2 years salary (headhunting, on boarding, up-skilling, training, etc) this is not really a financial calculation but a matter of respect and dignity, and of treating our employees right. When we so clearly demonstrate that our employees are second class citizens they become disengaged and stop caring about service. 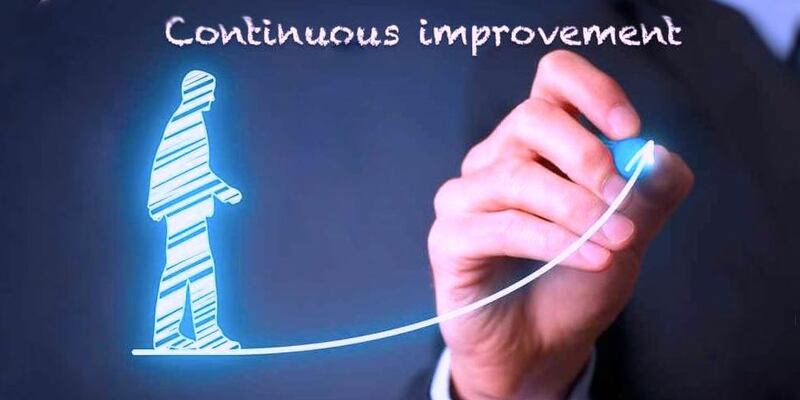 When we support and grow our people their success supports our success. Nobody cares about the slogans we spout, they judge us based on our actions. When we support and treat our staff well they are more likely to help us support and treat our customers well. When we put profits over people we are encouraging this behaviour in our staff and cannot be surprised when all they seem to care about is more money. 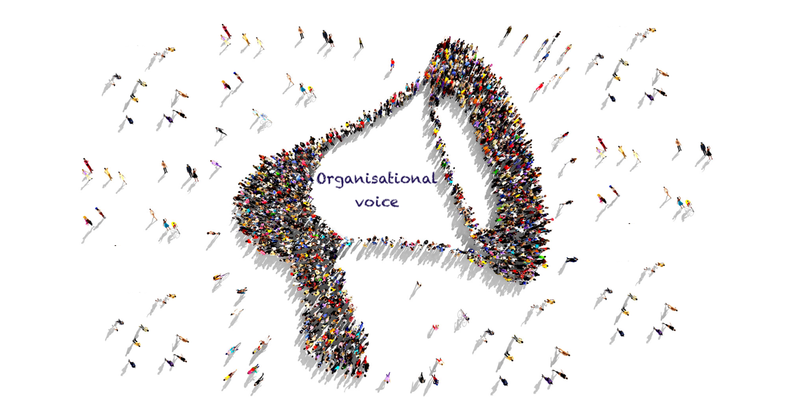 Put your people first, and watch the way they deliver customer service change. How we treat our people is how they treat our customers.